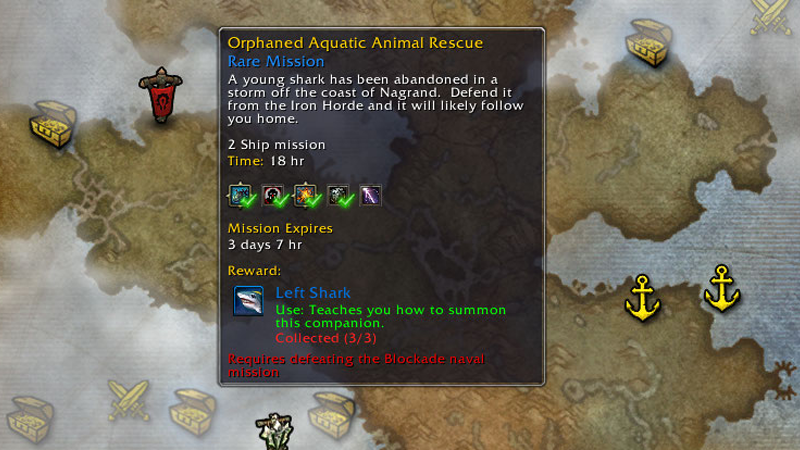 Left Sharks are rewards for one of the rare Garrison Shipyard missions that you send your followers out on. It’s a rare mission, so you shouldn’t see it much and for months, that was the case. People however complained that these rare missions just won’t appear and they can’t even try to collect all the rare goodies. So Blizzard hotfixed the Shipyard back in November, fixing a bunch of things, and this tiny issue as well. But now it’s the exact opposite. For most players, this particular rare mission rewarding a Left Shark (yeah, the name is a reference to that Katy Perry performance at the Super Bowl) pet is available all the time! Just checked in to see if it’s there, and yup, even its spawning spot is the same. The trick might be to leave that spot alone when the Left Shark is not spawned and do only the top missions on the map, hoping for other rares. But if you have multiple alts with a Shipyard, good luck getting rid of the Left Shark in the first place. These pets are tradeable, so at least people can make some gold by selling them, right? Well, not really. Other blue pets might sell for thousands of gold on the Auction House, but not the Left Shark! This isn’t a game breaking thing, maybe a bit annoying for those who want to collect the other rares (see the achievement above). But it’s certainly a funny one.